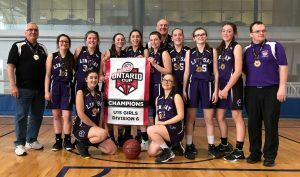 The Lindsay Wildcats U15 Midget Girls brought home Gold Medals from the Ontario Cup Championships held in Whitby. Posting wins over Oakville (46-33), South Simcoe (36-32), and Etobicoke (35-27) in the round-robin, the girls had a balance of good shooting, passing and defense to build to the final. In the Gold Medal game, the girls bested Collingwood 47-35 to capture top honours. Congratulations to the players and coaches on a very successful season.